We are making all type of disc brush. As per customer requirement we are develop every type of raw materials. These Disc Brushes are also flat brushes but with circular base tufted with bristles, bristle may be of natural or synthetic fibers depending on the areas of application. Floor cleaning disc made with water proof plywood or plastic base is a good example of these brushes. These Disk Brushes are used in various purposes. We have various types of brush with different colors. We provide these brush at economical price. Our planetary head deburring brushes are specially designed to offer best deburring performance and high part life. Suitable for deburring any machined metal auto parts. We use high quality imported abrasive bristles in our brushes. Diameter of brushes varies from 50mm to 400mm. Available abrasive grits are #80, #120, #180, #240, #320 and #500. Custom sizes and shapes are also available. These brushes are also called as Flat Brushes but with circular base tufted with bristles, bristle may be of natural or synthetic fibers depending on the areas of application. 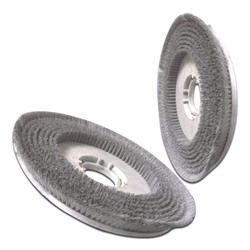 Floor cleaning disc made with water proof plywood or plastic base is a good example of these brushes. We are offering our client an excellent quality range of Heavy Sector Straight Deburring brushes. For cleaning, deburring and polishing threads, inner walls of tubes and cylinders. Advisable for use in power tools. Provides a high degree of bristle stiffness with minimal flexing.